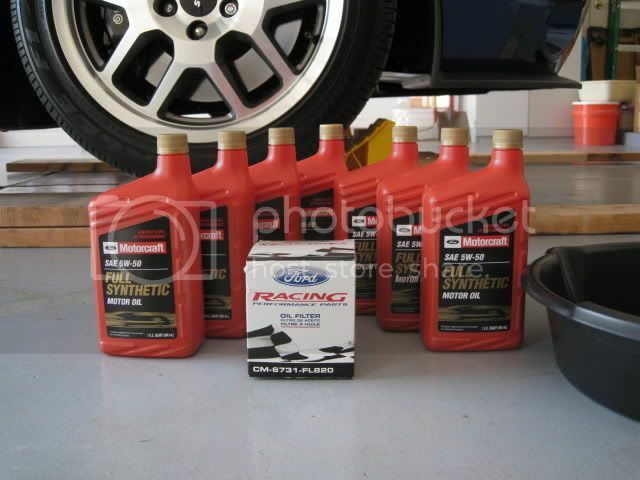 Here is how I change the engine oil on my 2007 GT500. Although the details (oil type & quantity, drain plug torque, etc.) 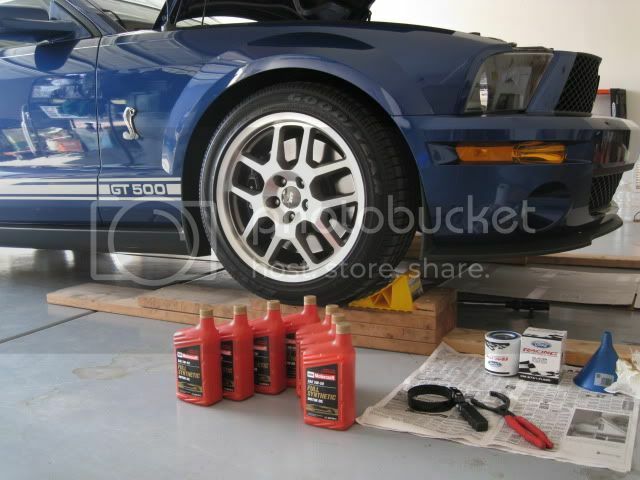 are specific to the 07 GT500, the same basic principles apply to any oil change. Caution: I don't advise changing the oil when the motor is hot to keep from being scalded by hot motor oil. I always allow the motor to cool down a bit. Consult the owner's manual to determine the type, viscosity and quantity of motor oil used for your particular vehicle and engine type. The recommended oil viscosity (and oil type "Full Synthetic") is also imprinted on the engine's oil filler cap so there's no excuse for using the wrong oil. My GT500 takes 6.5 quarts of 5W50 Full Synthetic oil. 1. Drive the front tires onto ramps, set the parking brake and chock the rear tires. After shutting down the engine, I usually allow the car to sit for 20 to 30 minutes to allow the oil to return to the oil pan before draining. 2. 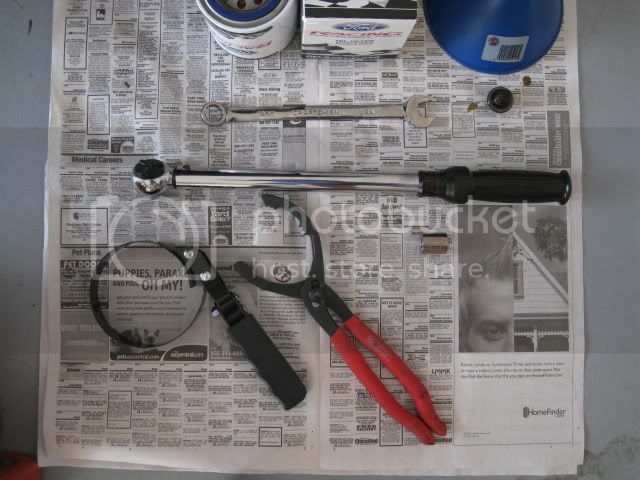 Place the drain pan below the drain plug and remove the drain plug (CCW) with a 16mm wrench. The production line workers at Ford must be amateur artists. 3. Allow the oil to drain out into the pan. 4. 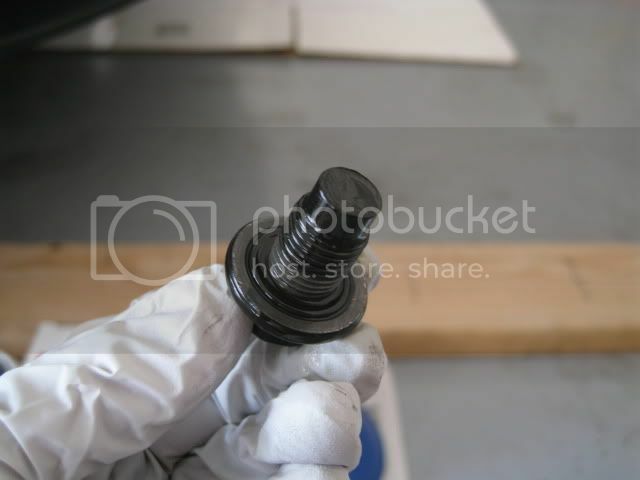 Wipe the oil off the drain plug and inspect the O-ring for damage; replace plug if damaged. 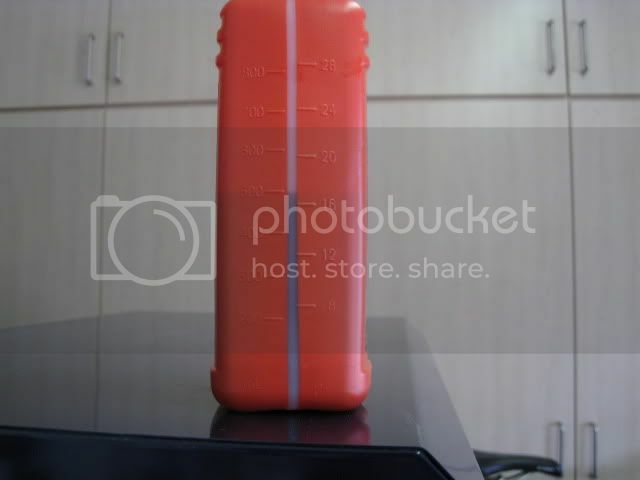 Leave a film of oil on the O-ring. 5. Re-install the drain plug back onto engine oil pan and torque to spec. The torque spec for my GT500's drain plug is 19 lb-ft. Wipe clean the oil pan area around the drain plug. 6. 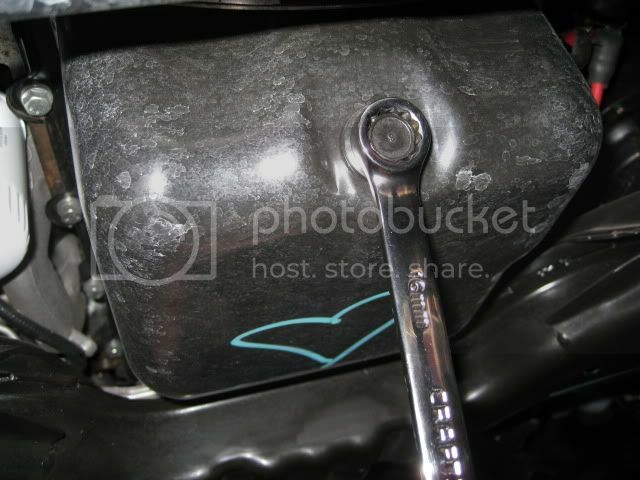 Loosen the oil filter with the oil filter wrench. If this is the first oil change, be advised the OEM filter is torqued on very tight and a plier type wrench is highly recommended. Caution: The filter is located right above a frame structure, once the filter is removed a gush of oil will flow from the fitting and drip all over the frame. 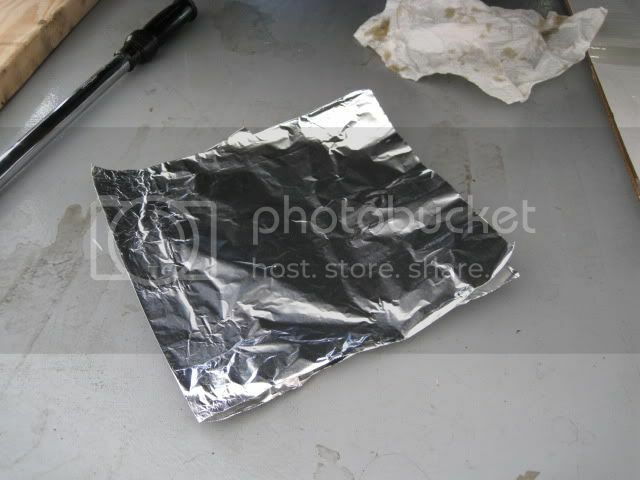 I fold a sheet of aluminum foil and place it under the filter to channel the oil into the pan. The filter will be slippery so keep a good grip on it as you remove it and be careful not to drop it into the already full oil drain pan. 7. 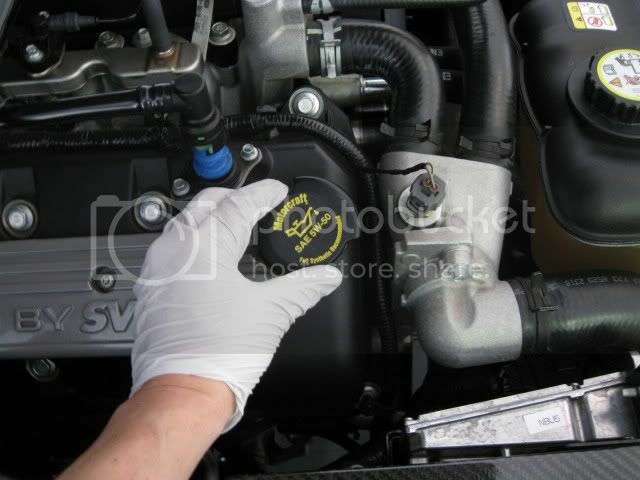 Inspect the oil filter receptacle to make sure the old filter's gasket did not remain affixed to it; otherwise it will certainly cause an oil leak. 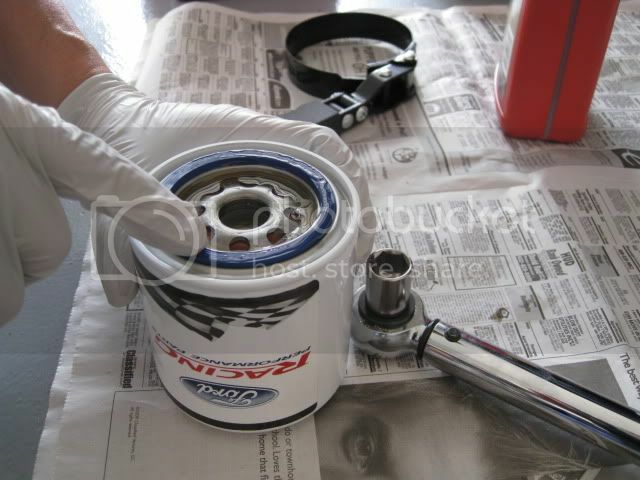 Then wipe clean the outer flange of the oil filter receptacle. 8. Prepare the new oil filter by pre-filling it with clean oil; I usually fill it up about 3/4 full. This will help oil pressure build up faster on engine start. You can pre-fill the filter whenever it is installed inverted like on the 5.4L motor. Don't try this if the filter mounts to the engine at an angle or you'll have a mess to clean up. 9. 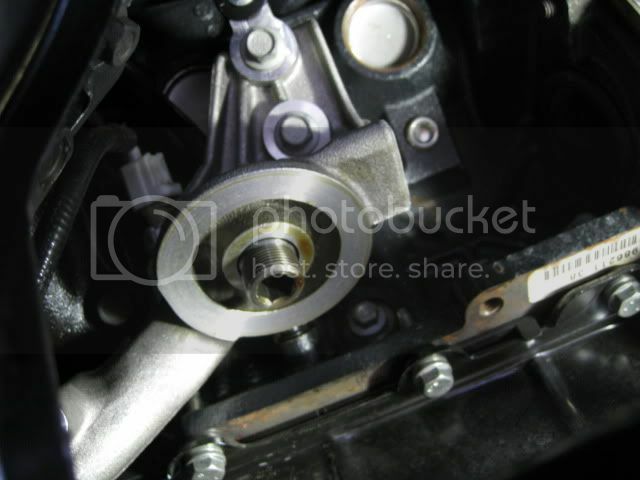 Then apply a thin film of oil on the filter gasket. 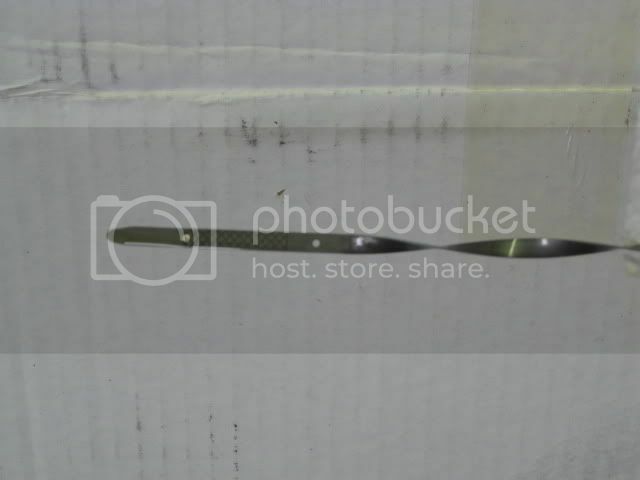 This will help seal the gasket and make the filter easy to remove the next time. If you neglect to do this, the filter will be very difficult to remove. Before installing the filter look on its label for tightening instructions. 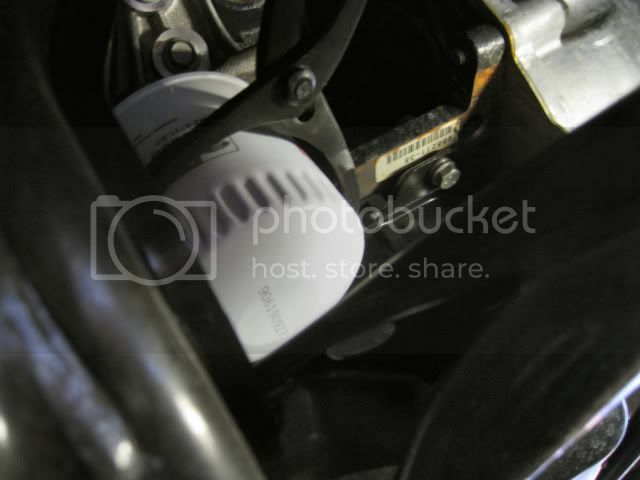 Sometimes the instructions are printed on the oil filter box. 10. Re-install the filter onto the engine receptacle and turn in a clock-wise direction until the gasket contacts the flange and stop. Then note the position of the filter (use label/printed characters for reference) and hand-tighten it as directed by the filter's instructions. Typically it is an additional 3/4 to 1 turn. 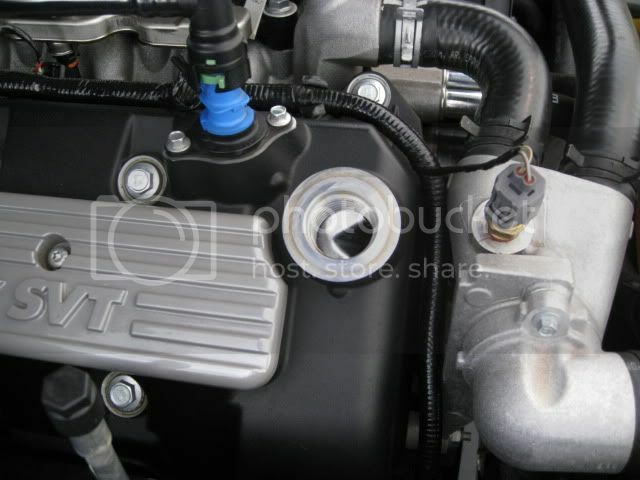 For the Ford Racing filter it is 1 to 1-1/4 turns. What I like to do is hand-tighten the filter first then use a strap type wrench to apply just a tad more of a crank - perhaps 1/32 to 1/16 of a turn just to make sure it is secure. Wipe off any oil that dripped onto the frame. 11. 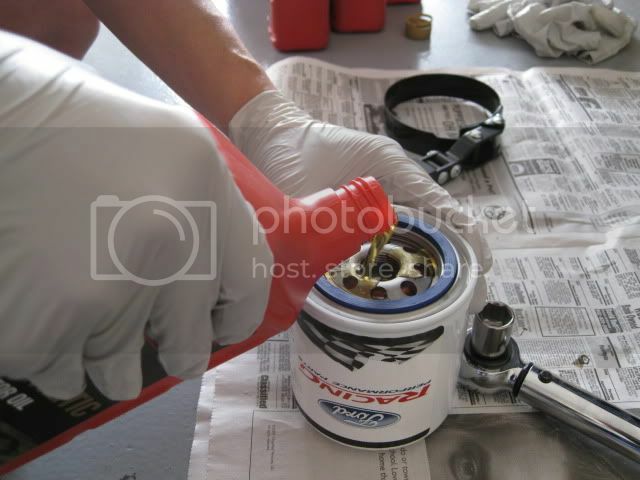 Remove the oil filler cap and pour in the oil until 6.5 quarts total is in the motor. 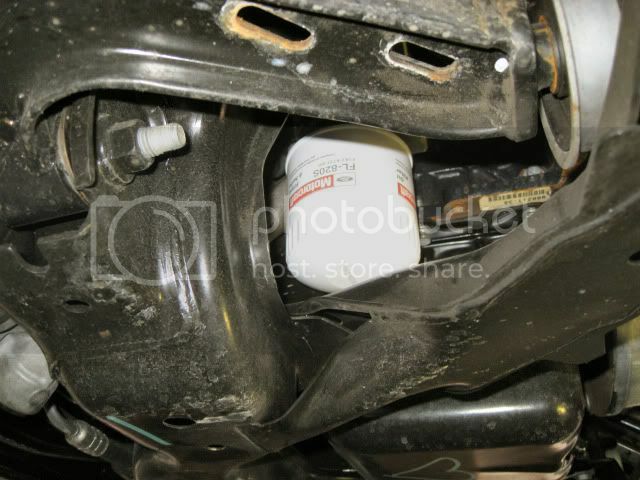 Let me clarify that some of that 6.5 quarts was already used to pre-fill the oil filter. 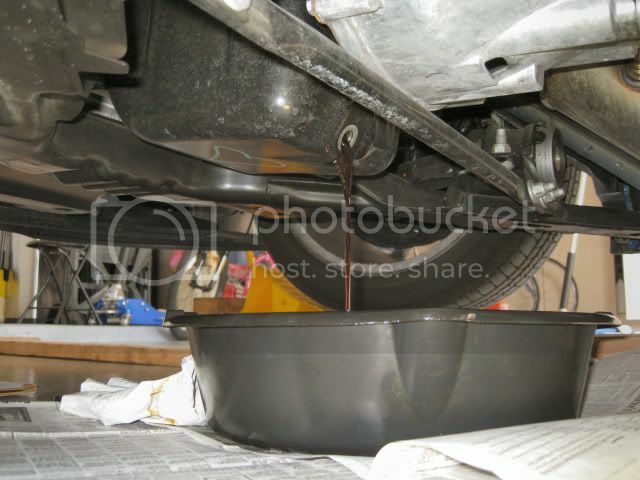 Use a funnel to keep from spilling oil all over the motor. On my other cars, I like to under-fill slightly (about 1 pint less than spec) to avoid over-filling, then I check the oil level at least 30 minutes after starting the car. It's always easier to add than to remove oil. Starting with seven quarts, I have about a 1/2 quart left over. 12. 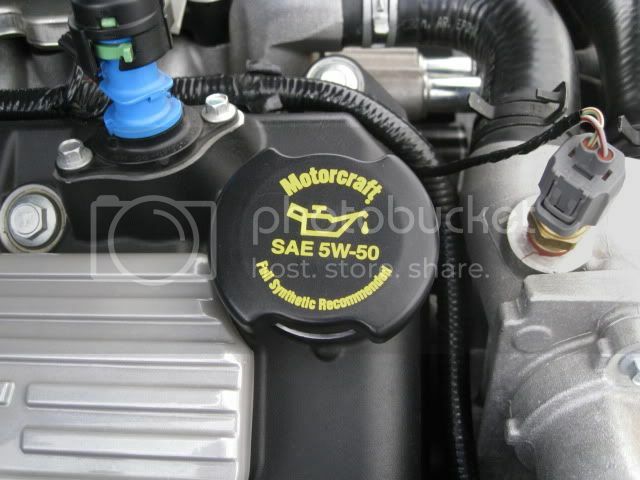 Re-install the oil filler cap - don't forget this step. 13. 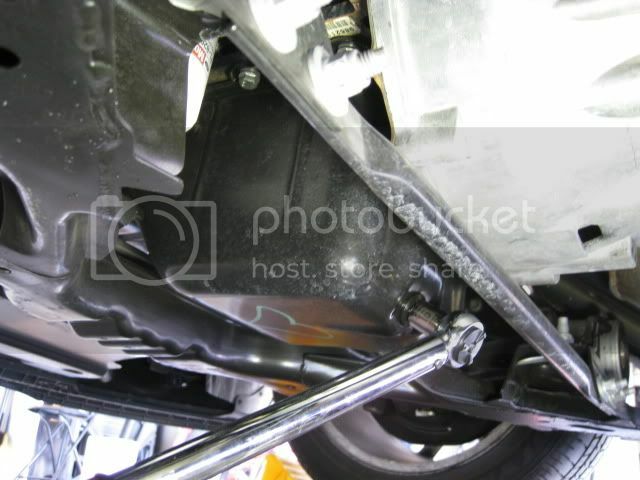 Remove the chocks, start the car, verify your oil pressure, and check for leaks under the car. 14. Park the car on a level surface, shutdown the engine and wait at least 30 minutes for the oil to return to the pan. Then check the dipstick to make sure the oil level reads in accordance with the manufacturer's recommendation. For the GT500, the oil level should be between the two small circles on the dipstick per the manual. With 6.5 quarts, my oil level reads at about 3/4 of the way up the cross-hatched area of the dipstick. Add oil if needed. 15. Record your mileage and date of service. 16. Pour the used motor oil into containers and take to your neighborhood oil recycling center. My local Checkers Auto Parts stores takes used oil. Filters can be taken to hazardous waste collection centers.